Since returning from my second Burning Man, many people have asked me how it was. Their eyes were typically wide open and expecting the unexpected. 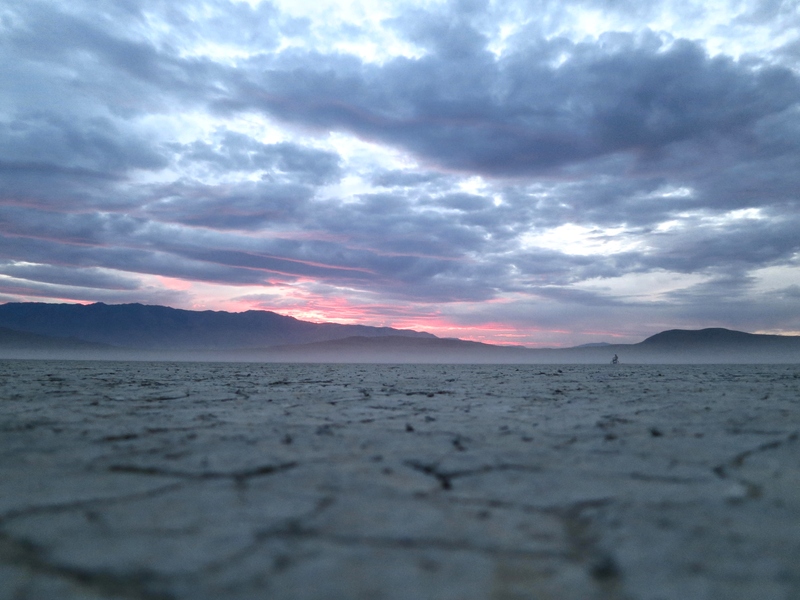 To their dismay, all I was able to say at the moment was, “It was a good experience.” For the few weeks after the playa, I found myself still processing it and eventually realizing that it was an exercise in growth more than anything else. Both years I’ve gone, I was blessed to be surrounded by the most genuine and dear friends. 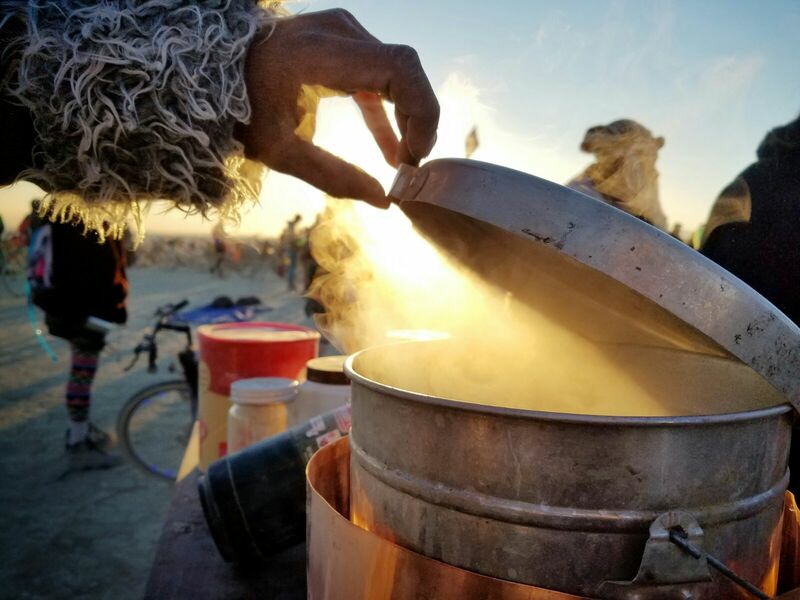 And before arriving our first year, four of us – Anand, Ankur, Raj, and myself – had the dream of building a chai cart and gifting fresh chai on the playa. With less than a month to depart, we quickly sketched up a few ideas, bought the materials, and built a chai cart for our first burn. 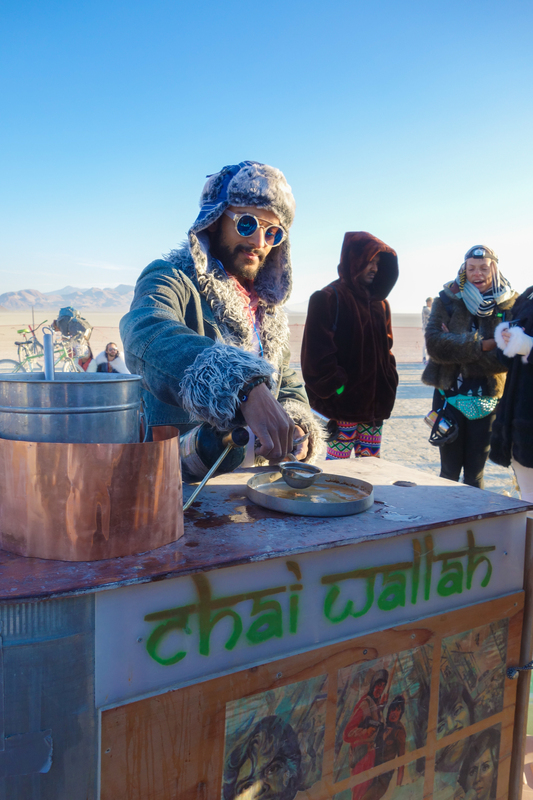 The Chai Wallahs of the playa were born and our chai was a hit. It is this act of gifting chai that has become integral to my experience at Burning Man. As with everything else given and received on the playa, the process of gifting is what allows the magic to unravel. By taking away any form of money or trade, the interactions with people receiving our chai were nothing but authentic. The unconditional sharing of a warm and soothing cup of chai brought out words and acts of gratitude well beyond what I’ve experienced in my daily life in San Francisco. Most people gave a hug. One British man said, “I’ve never had so much love poured into a cup of tea for me.” Another woman said “You are divine,” while clasping her hands. And this year, a Venezuelan man named Max, kept returning for three total servings with extra chunks of ginger and called the Chai – “El mejor, mejor, mejor!” The love I felt was overwhelming, warming, and addicting. What was it about this simple act that was so magical? Most were enamored with the process – the chopping of fresh ginger, the heat emanating from a rolling boil, the aroma of black tea, the milk morphing it into a reddish clay hue, and eventually sipping on the heart-warming spicy cup of chai. But, there was something beyond just that process. That short moment of sharing and enjoying created trust and community in that space around the chai cart. For me, that momentary attempt of unconditional gifting is the most sacred. It is an exercise of expanding my heart, while expecting close to nothing in return – perhaps just a smile as a token of gratitude. Nothing more. But, what I received was something far greater. 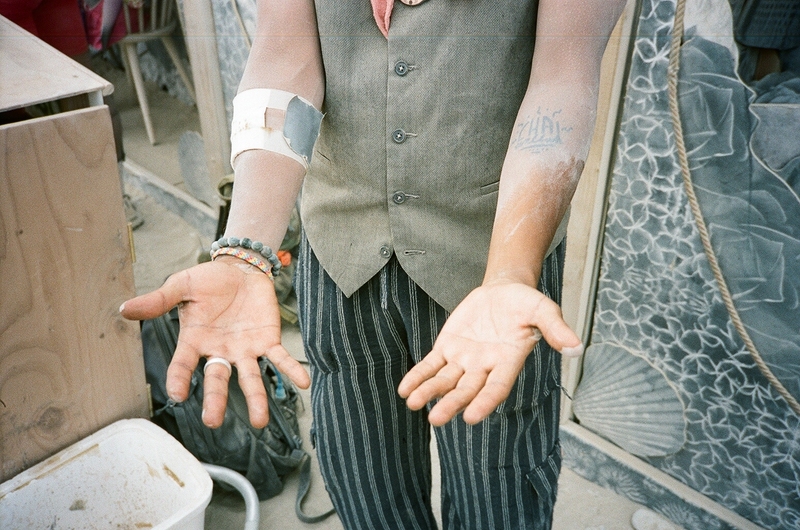 In a dream I had after Burning Man, I was gifted with blindness. And my superpower became empathy. The love I gave could see no color, creed, physical conformation, or gender. I was able to see with my heart only, and the result was unbounded love that grew blindly in all directions. Including inward towards myself. I believe this to be a dream worth working towards, and my hope is that with each cup of chai gifted, I will bring that dream closer. This entry was posted in North America and tagged burning, burning man, chai, dust, empathy, ginger, love, man, playa. Bookmark the permalink. > In a dream I had after Burning Man, I was gifted with blindness. And my superpower became empathy. The love I gave could see no color, creed, physical conformation, or gender. I was able to see with my heart only, and the result was unbounded love that grew blindly in all directions. Including inward towards myself.